The Chamberlain® Part 041A3261-1 is a dual speed gear and sprocket replacement kit. This gear and sprocket kit is compatible with various dual sprocket garage door openers. 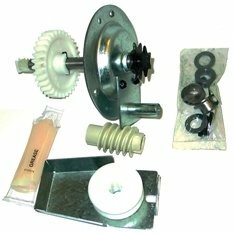 This complete gear kit includes these items; helical gear, worm gear, wear bushings, grease, and hardware needed to replace the dual speed sprocket with gears. * 041A3261-1 is a replacement kit and is used to replace the 41C4206A gear kit. You Can Email Us For Help. In Stock And Ships The Next Business Day!